Eight years after Hillary Clinton helped unite Democrats behind Barack Obama's presidential campaign, he returned the favor. Obama and Clinton made their first joint appearance of the 2016 campaign Tuesday in North Carolina, hours after FBI Director James Comey announced he was not recommending charges be brought against Clinton for her controversial email practices at the State Department. Clinton and Obama made no mention of Comey's announcement in the speech, in which Obama trumpeted Clinton's record as his secretary of state, saying she is more qualified than anyone else in history to be president. "I'm ready to pass the baton, and I know Hillary Clinton is going to take it, and I know that she can run that race," Obama said. Clinton, who introduced the president, outlined the ways her administration would "build on the vision of America that President Obama has always championed." 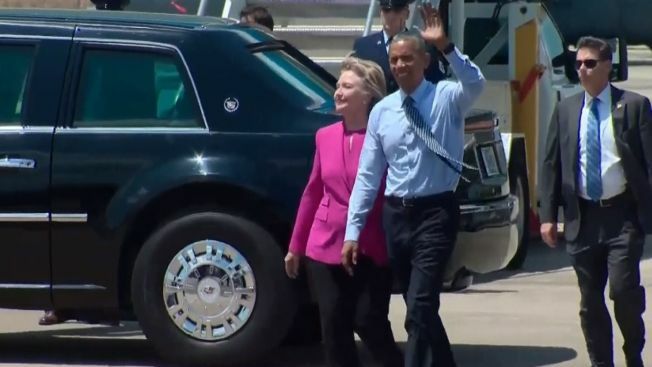 Clinton and Obama were all smiles as they stepped off Air Force One after a quick flight from Washington, pausing side-by-side to wave for cameras. Then they walked together to greet supporters on the concrete before leaving in a motorcade. Still, Comey's scathing critique of Clinton — he called her "extremely careless" in her handling of classified information — ensures the matter with continue to hang over her campaign through November. The timing also drags the president into a controversy he has at times tried to keep at arm's length. Obama's appearance with Clinton is a potent reminder that it was his political appointee who declined to pursue criminal charges against his preferred successor. But Obama took aim at Clinton's likely opponent in the general election, Donald Trump, for large portions of his speech, making fun of his proclivity for tweeting: "Sasha tweets, but she doesn’t think that she thereby should be sitting behind the (president's) desk." 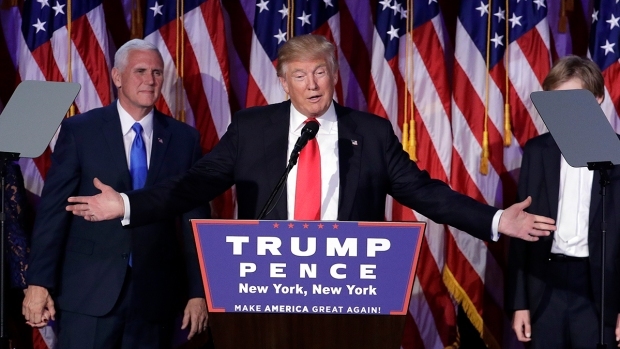 Obama said both that Trump is not qualified to be president and that Clinton would better represent the people whom Trump claims to fight for. 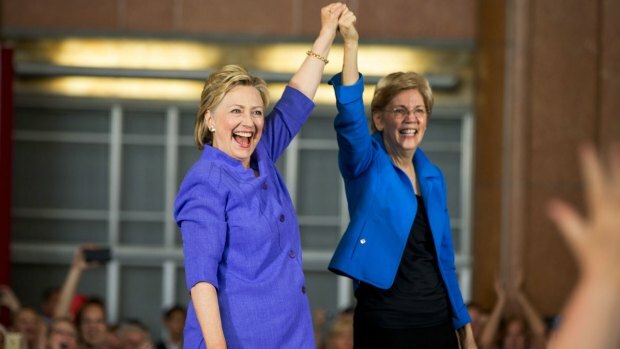 Elizabeth Warren paired with Democratic presumptive nominee Hillary Clinton in Cincinnati for their first joint campaign event. She's mobilizing her forces behind Clinton, lending her presidential bid a powerful boost of liberal credibility. "If your concern is working people, then this is not a choice. I don't care whether you are white, black, Hispanic, Native America, polka dot, male, female," Obama said. Trump didn't tweet any responses during the speech. Earlier Tuesday, White House press secretary Josh Earnest dodged questions about the FBI investigation's findings and how they reflect on Clinton. He said the White House is trying to avoid the appearance of interfering while the Justice Department considers whether to charge Clinton. Trump, the presumptive Republican nominee, who was making his own campaign stop in North Carolina later Tuesday, tweeted that Comey's decision was evidence of a "rigged" system. Democrats hope Obama's presence on the campaign trail can alleviate voters' questions about Clinton's honesty and trustworthiness, some of which stem from the email investigation. The president is expected to outline his own evolution from a Clinton skeptic to one of her biggest boosters. The Clinton campaign is also hoping Obama's presence at her side serves as a reminder of other aspects of her State Department tenure. For four years, Obama trusted her to circle the globe representing his foreign policy. She sat at his side in the Situation Room. She was the good soldier, putting aside her political ego to join the administration of the man who defeated her. During her tenure at the State Department she was viewed favorably by most Americans. Obama and Clinton traveled to North Carolina together on Air Force One. Clinton's Republican presidential rival objected to the travel plan. "Why is President Obama allowed to use Air Force One on the campaign trail with Crooked Hillary?" Trump tweeted. "Who pays?" Obama made his first campaign appearance with Clinton during a wave of popularity unlike anything he's experienced since his first term. Clinton aides say they're confident they could deploy him in any battleground state, though they believe he'll be particularly effective in rallying young people, as well as black and Hispanic voters, and will be instrumental in voter registration efforts. In a series of remarks in recent weeks, the president has proven himself to be one of the Democrats' most effective critics of Trump. From his perch at the White House and on the world stage, Obama has regularly found ways to blast Trump's message and mock his style. Still, Obama won't spend the next four months as the "Trump-troller in chief," as one official put it. Obama plans to take a largely positive message on the road as his campaigning picks up later this summer. That's in part because he's campaigning for the continuation of his agenda — as well as Clinton's. On health care, immigration, financial reform and the environment, Clinton is largely promising a continuation or acceleration of Obama's policies. Obama narrowly won North Carolina in the 2008 presidential election, becoming the first Democrat to win the state since 1976. But he was dogged by a sluggish economy and disappointment among some swing voters during his 2012 re-election, and lost to Republican Mitt Romney by 2 percentage points.